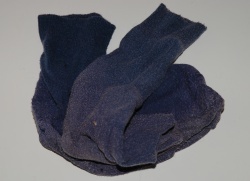 How can I reuse or upcycle trainer socks/glove socks/foot socks? | How can I recycle this? There’s always cutting them into rings or strips to use in weaving, knitting, or crochet. Socks make great bath mats and washcloths! I have tons of them from when my sons went through that stage. I now use them for cleaning, especially in the bathroom. Slip one over your hand like a glove and clean away. Fill with expired or not your favorite flavor to drink coffee beans and make a knot or sew closed to make a coffee scented air refreshened. Or put some other rags or toy stuffing and catnip, and make a knot or sew closed to make a new cat toy. When I have socks, underwear, old t shirts, etc. that are “done”, I wash them one more time and save them for a trip. I pack those “oldies” to discard along the way rather than wash them again. It beats looking for a laundromat or paying some else to wash them again. When I’m done with the item, I leave it beside the waste basket should someone else find another use for it. By the end of the trip I have room in my suitcase for the souvenier T-shirts. Wear around the house or at night, in bed. Catnip in one, and cover up with 2nd. Tie or sew the end and you have happy cats! I actually did a post on this! I love this post! Such a clever idea for socks. I like what Sherry says about using them as gloves for cleaning! What about upcycling old bikinis? I found this blog about it. Check it out! Hi! I just discovered this site and it is very interesting! It is in Greek, but you will get to understand how it is done because I have a lot of pictures. You can always fill it with the cloth left-overs or other fabrics you haven’t found use for. Make long socks out of them for your dog. My mom used to take old dollar store bars of soap and put them into a cuffless sock with the opening on an edge. She’d then use straight pins (nowadays could even use decorative pins) to pin a border of lace around the soap. We’d put them into our drawers as sachets. Large socks are good to store golf balls and other small bolls in them, toys and hang in a garage.